Jesika French is an attorney at Jones Day focusing on complex civil litigation in state and federal courts, including the defense of individual and class action product liability lawsuits. 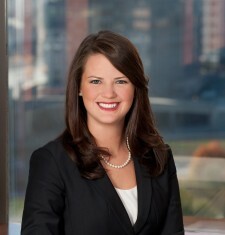 She is also an active member of the Junior League of Atlanta where she currently serves on the Human Trafficking and Commercial Sexual Exploitation Committee. Jesika traces her confidence and ability to speak in court back to her days as an actor and dancer in her high school musicals and has a love of dance and performance art. As the first in the family to graduate from college and recognizing the difficulty of navigating college applications and financial aid, she works with the Apprentice Corporation on college readiness and hosts workshops on personal finances. In her free time, she enjoys going to Falcons games with her husband, Daniel and spending time with her dogs, Pippa and Jack.